Empirical investigations of collaborative practices. Findings, guidelines, and/or studies related to communication, collaboration, and social technologies, practices, or use. System design. How can we support cooperative work in increasingly complex, networked settings? Hardware, architectures, infrastructures, interaction design, technical foundations, algorithms, and/or toolkits that enable the building of new social and collaborative systems and experiences. Methodologies and tools. Methods for investigating human practices: the nature of ethnography and the role of other innovative methods and tools in building systems or studying their use. Theories. Critical analysis or theory with clear relevance to study or design of collaborative settings and systems. Domain-specific social and collaborative applications. Including applications to digital civics, grassroots movements, healthcare, transportation, ICT4D, sustainability, education, accessibility, global collaboration, or other domains. Ethics and policy implications. Analysis of the implications of socio-technical systems, the values that inform them, and the algorithms that shape them. Design fictions. Discussions and extrapolations of work-practices and technologies, which make a contribution to the core topics of ECSCW. For examples of design fictions from other conferences, please see Proceedings of GROUP 2016 and GROUP 2018 in the ACM Digital Library. 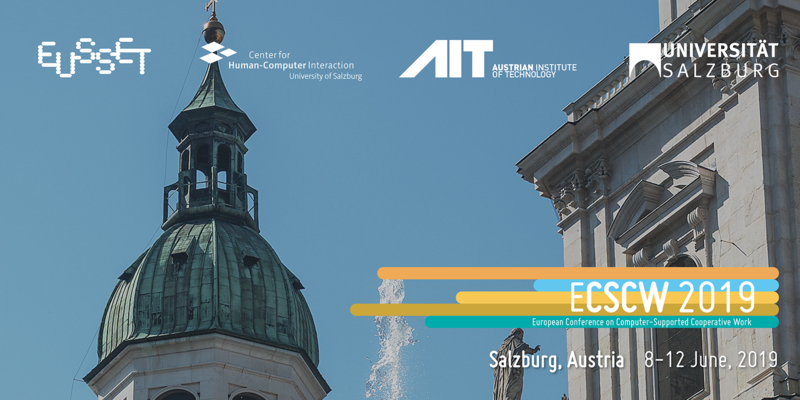 ECSCW is a single-track conference that contributes to developing an interdisciplinary and global community, sponsored by EUSSET, the European Society for Socially Embedded Technologies. The conference format facilitates critical discussion across disciplinary and national borders in the field. An overview of earlier ECSCW conferences (and proceedings) is available at http://www.ecscw.org. Submitted papers documenting original, rich, and in-depth contributions to CSCW will follow a journal-level review process. Accepted submissions will be published in Computer Supported Cooperative Work (CSCW): The Journal of Collaborative Computing and Work Practices, a journal with a high impact factor of 1.784. Upon acceptance of the paper for the journal, authors are requested to present their work at the conference. Every year, ECSCW presents a best paper award to the sum of 500 euros, sponsored by Naver Labs. Authors are encouraged to submit earlier than the deadline. Early submissions will allow for more time for the Revise & Resubmit phase and will generally result into earlier publication of the accepted manuscript in the Journal. Please note that after submitting their articles for production, authors might be required to make additional revisions, according to the publication standards of the Journal. The papers with a length between 10,000 and 15,000 words (excluding references) may be submitted at the link: https://www.editorialmanager.com/cosu by selecting SI: ECSCW 2019 as article type. Paper submissions should be formatted following the CSCW Journal Instructions to Authors. Please keep in mind that submissions will be reviewed as journal contributions and that, as per Journal of CSCW policy, the papers review process will be single-blind. Papers accepted for publication in the CSCW Journal are typeset (taking the digital document as input), however authors who want to use a template for preparing their submissions may want to use this MS Word template or this LaTeX template.